Todd Gardner’s “Drifters: A guide to the stray tropical fishes of New York”. 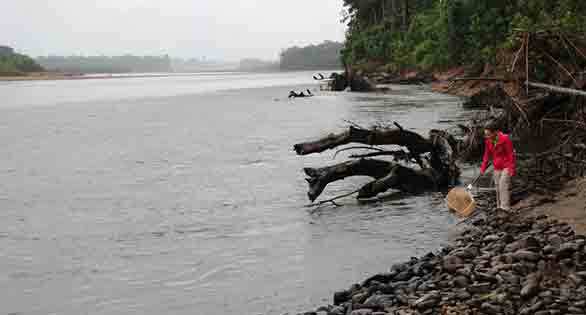 In the northern part of the U.S., the onset of summer ushers in prime time for the pursuit of native fishes in our backyard waters. While “native fishes” often elicit thoughts of Rainbow Darters, Sunfishes or one of a few killifishes, we should probably remember our local marine life this summer. One of Todd Gardner’s most overt passions is for the saltwater fishes found in the waters off his Long Island, New York home. I remember being simply floored when he first shared with me a handful of truly tiny but well-adjusted juvenile Four-Eyed Butterflyfish (Chaetodon capistratus) caught off the coast of Long Island. To this day, I try to scheme ways to sneak off to New York in the late summer or early fall to try my luck at catching these miraculous little fish in such an unusual setting. 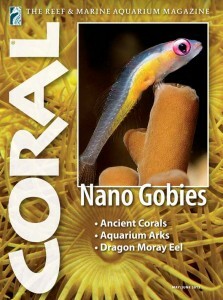 Gardner, currently an Assistant Professor of Marine Biology at Suffolk County Community College, first shared his pursuits with CORAL Magazine readers in the article “Long Island Gold Rush,” published in the May/June 2012 issue, which you can read in the digital archive or as a back issue. 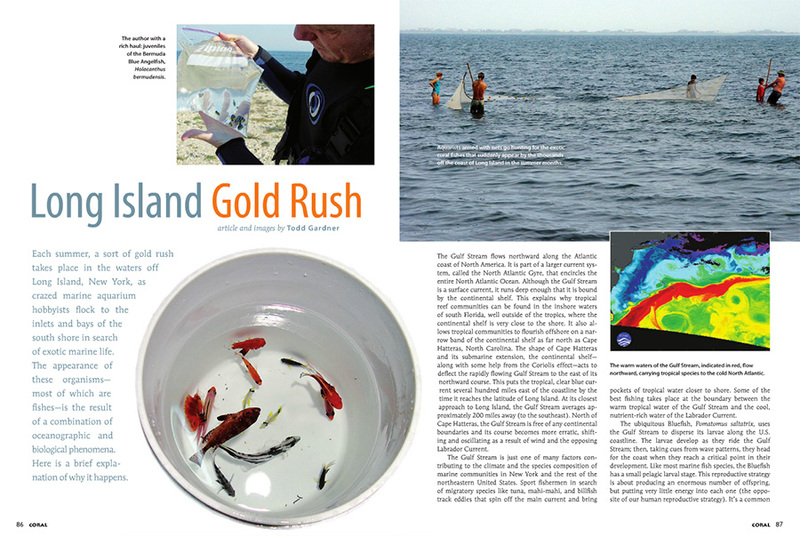 The opening pages of Long Island Gold Rush, by Todd Gardner, from the May/June 2012 issue of CORAL Magazine. Indeed, a baffling array of tropical reef fishes from Atlantic coral reefs to the south make brief appearances off the shores of Long Island in late summer, and most are presumed to meet grizzly, bitter-cold ends as summer gives way first to autumn and finally to icy winter. 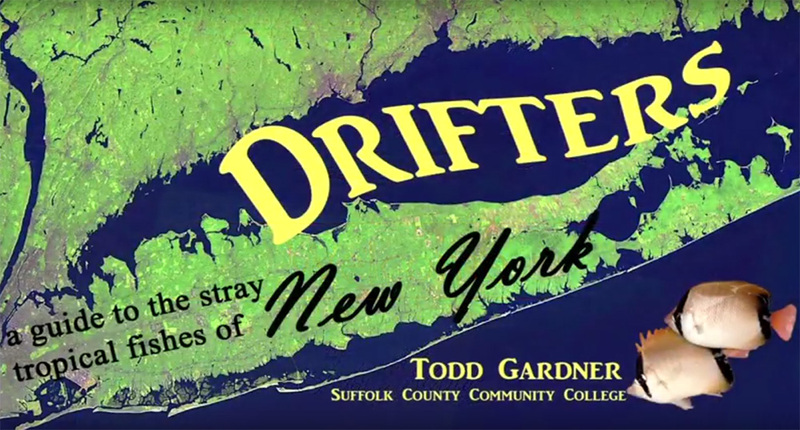 Gardner’s presentation, Drifters: A Guide to the Stray Tropical Fishes of New York, was recorded at the 2nd annual Long Island Natural History Conference, held at Brookhaven National Laboratory on Dec. 6, 2013, and was recently made available on YouTube. This was also the talk Gardner gave at the the 2015 Marine Aquarium Conference of North America (MACNA); considering I didn’t get have a moment to see a talk last year, I was pretty excited to get this second chance! Over the course of the next 45 minutes, watch and listen as Gardner gives an exhaustive accounting of the tropical strays he’s encountered over the years, including musings on where they can be found and whether some species truly are “tropicals,” or perhaps more native to the waters off Long Island than might be currently thought. If you find talks like Gardner’s of more general interest, I might also encourage you to watch the other talks from the event, such as Dave Taft’s look at “saprophytes, parasites, mycoheterotrophs and mixotrops” in Hide and Seek in the Wilds of Long Island (hint: the native orchids are at the end), or Eric Lamont and Tom Nelson’s Status of Orchids on Long Island (I know some fish folk have secret loves for these plants, and the photography tips alone in the first 5 minutes are worth the look), along with dozens of others that can be found on the Long Island Natural History Conference YouTube Channel.